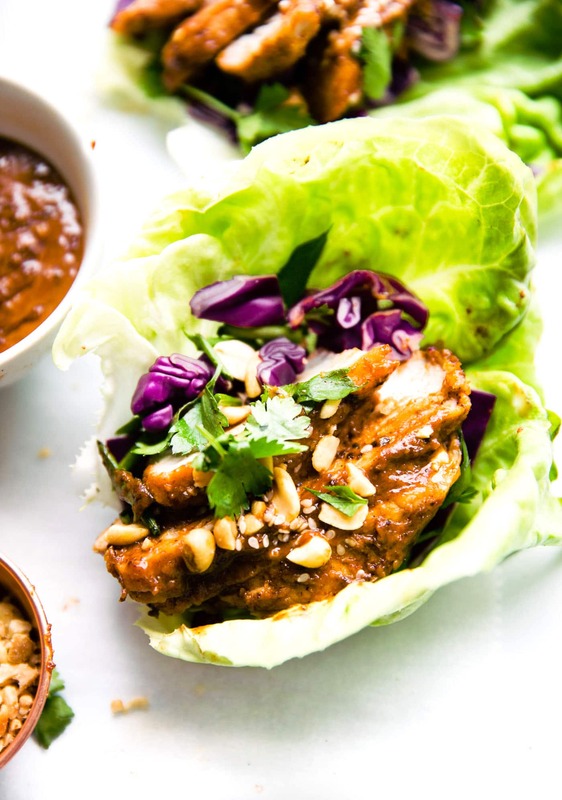 Chinese BBQ pork cooked in an Instant Pot or on your stove top, then served in lettuce wraps with purple cabbage, crushed nuts and fresh cilantro. 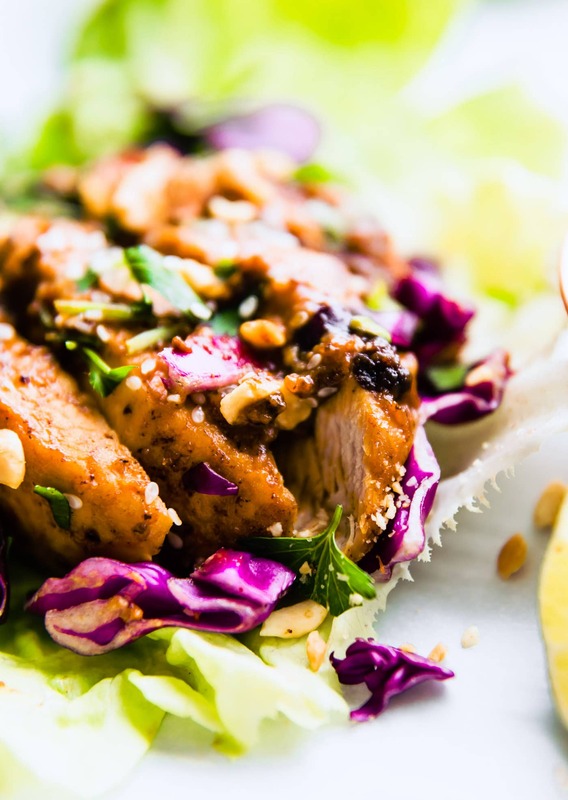 This easy and healthy BBQ pork recipe is perfect for lunch or a light summer dinner. 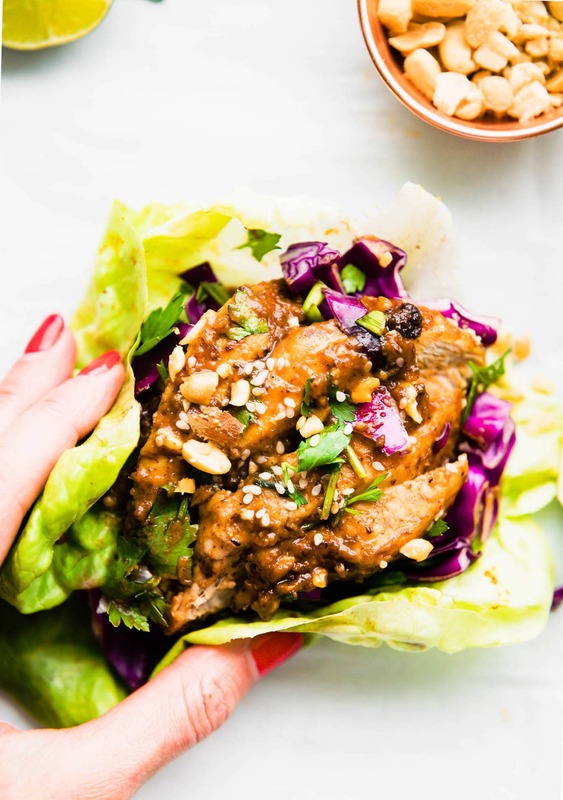 These delicious Instant Pot Sticky Chinese BBQ Pork Lettuce Wraps are great for meal prep, too! 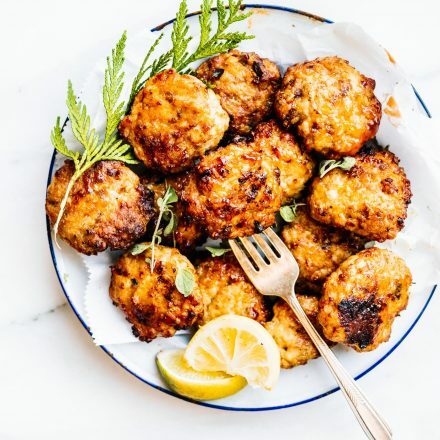 Gluten free, grain free, dairy free, and paleo recipe options. Before we begin. I must confess, I had a slight mishap in my schedule. You will understand everything when I update you on life… le sigh. That being said, this recipe was not supposed to be published in July because it’s not “technically” nut free. BUT, we’re going with it! And I am giving NUT FREE OPTIONS before the recipe. NOTED! Mmm k? and INSTA…. QUICK WAY. As in instapot pressure cooker option. Oh yes, I just went there! You see, Chinese BBQ pork ribs from an Asian restaurant are insanely delicious, don’t deny it, they are! But at the same time, that BBQ RIB goodness is typically made with a sticky sauce packed with sugar, MSG, and other unhealthy, un-Cotter-like ingredients. Also, pork spare ribs are loaded with the not so good fat and very little lean meat. So naturally, I was determined to make a Sticky Chinese BBQ Pork Ribs recipe in a Cotter-approved, healthier way! 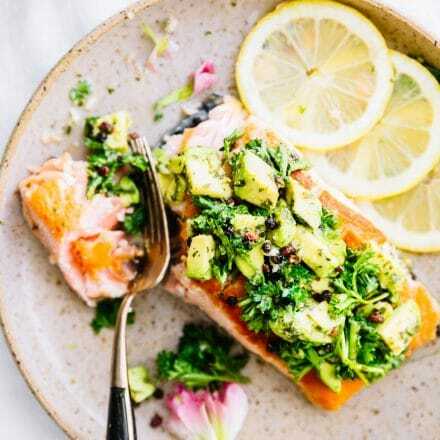 This is another Instant Pot (pressure cooker) recipe with a stove top option. It’s also a quick and lighter way to make ribs, too! Praise the FOODIE Gods! The sticky sauce makes the pork loin ribs more moist and flavorful, without the need for extra fat. Are Spare Ribs or Baby Back Ribs Better? Baby back ribs (also called back ribs or loin ribs) are cut from the top of the rib cage, below the loin muscle. They have meat between the bones and on top of the bones and are usually meatier than spare ribs. Gluten free sweet BBQ sauce (So diggin this paleo brand right now). That sauce alone is worth making and eating alone with spoon.. Which we so gladly did! 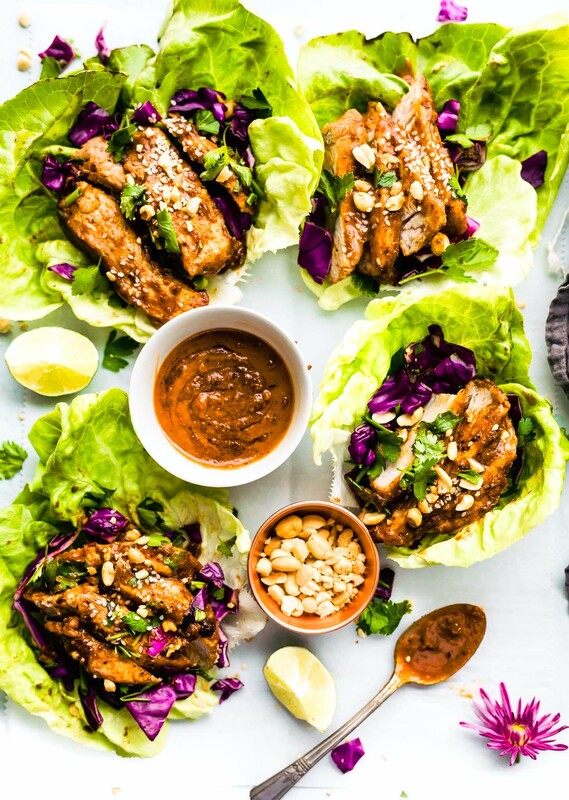 That being said, go turn on that Instant Pot of yours and make some sticky Chinese ribs, then meal prep some of these Sticky Chinese Ribs Lettuce Wraps. EVERYONE at the office will be jealous, because you’ll be eating the best healthy Chinese BBQ in town! Note –> Nut free topping– skip the crushed nuts and just add sesame seeds! Fresh Cilantro to garnish and Red pepper flakes. First mix your sauce ingredients together in a small bowl. Set aside. Note that the sauce might not creamy at first, but you will melt that later. Place your pork ribs in the instant pot with sesame oil. Place on saute for 2 minutes, searing the the pork ribs. Remove the ribs and place on a plate. Next, add in your sauce. Continue to sauté the sauce until it is melted and smooth. Then place your seared ribs in with the sauce and coat them evenly. Add in a splash of lime and water and mix again. Turn off method and place lid on top of pressure cooker. Turn on the pressure cook manual and cook for 18-20. Then Slow release. 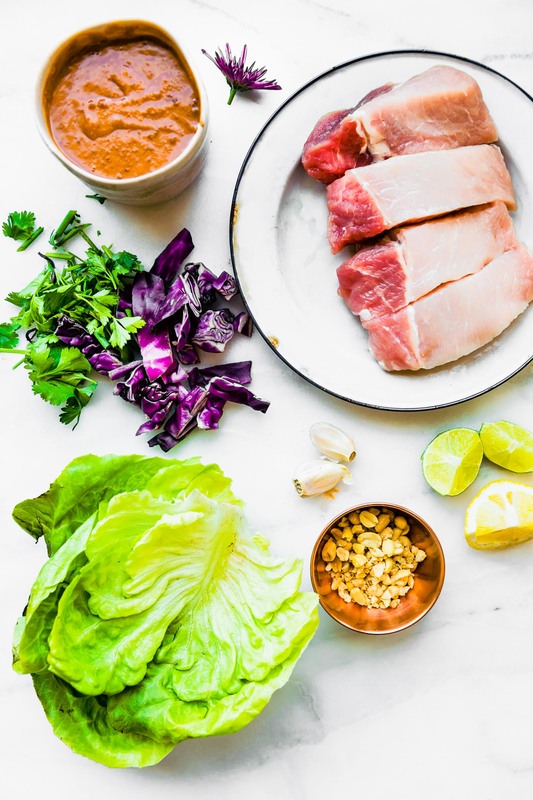 Slice the pork into pieces and place into lettuce wraps with chopped cabbage, cilantro, crush nuts (optional), and red pepper flakes. Spoon extra sauce on top. There should be enough sticky sauce from the pot to use as dipping sauce as well. Alternatively, you can reserve 1/3 c of the sauce once melted to use as dipping sauce, but it will not be sticky since it will not be cooked. See notes on how to avoid the sauce from burning and for Stove top Option. For Stove Top Option – If you’re cooking on the stove top. You follow same first steps (sear ribs, melt sauce), except you will need to add an extra 2 to 3 tablespoons of water o broth to mix in with the sauce ribs. Cook on Medium low for about 30 minutes. Continue to coat the ribs when cooking. Check for doneness around 20 minutes. 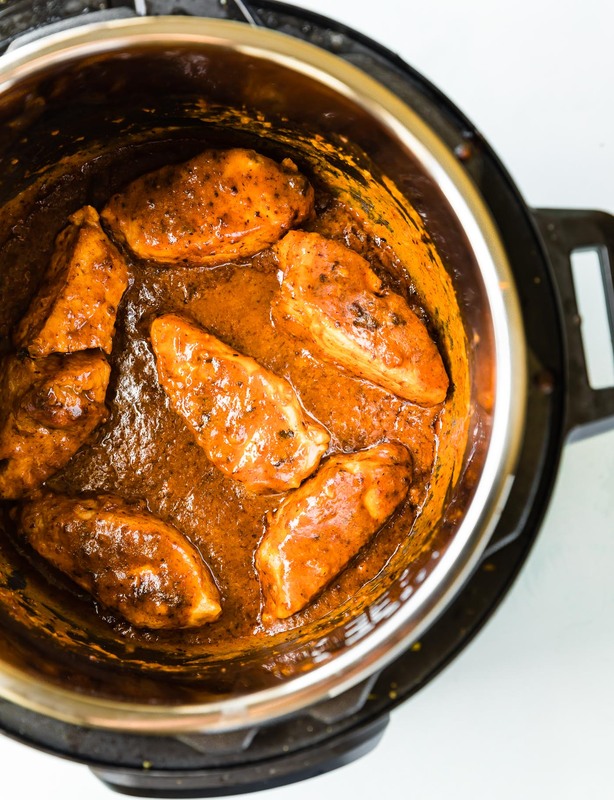 The sauce tends to stick more on the stove (in the pan) than in the instant pot. You could use this in the slow cooker for three hours on high for five to six hours on low. To avoid sauce from burning: If you add in sauce without melting it will cause the sauce to caramelize but not burn. Be sure to add the sauce first, then the seared ribs back in. Either way, if the sauce burns, it scrubs away very easily. Alright my friends, what’s your latest and greatest BBQ recipe? Live it up while Summer is going strong! p.s Our 5 day Instagram Giveaway starts Today! WOO! This looks delicious. Do you think it would work with chicken? totally! I think it would cook in around 15 minutes though. Ya know? This sounds amazing. Vegas loves her some Asian food. If she EVER moves in with me, I’m making this for her! wow, do I really need an instant pot?? Well yes and no! 😉 Stove top works but so does the grill. Which I know you like. But instapot is quite easy. LOVE mine! 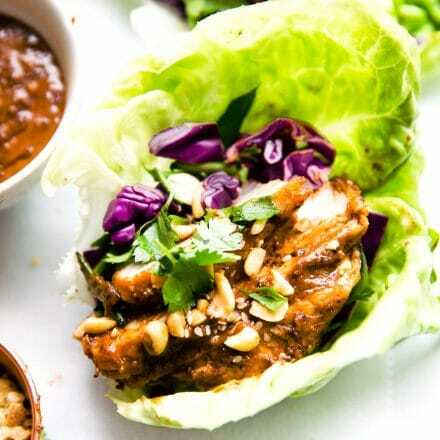 LOVE lettuce wraps and using the IP for this is brilliant! Making this for lunch! I am so inspired by your photos! oh yay! Keep me posted Jenn. Loin ribs are my fave too, but that sticky sauce is what is taking these bad boys to the next level. 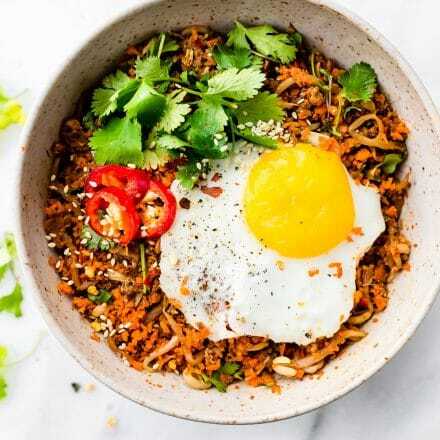 Love that it’s Instant Pot friendly too. So dang fast! Girl I drool over your Baby Back Instant pot ribs. Rib party? 😉 Your place. I’m there. Lettuce wraps are my FAV! These look AMAZING! Love the flavors in this wrap! 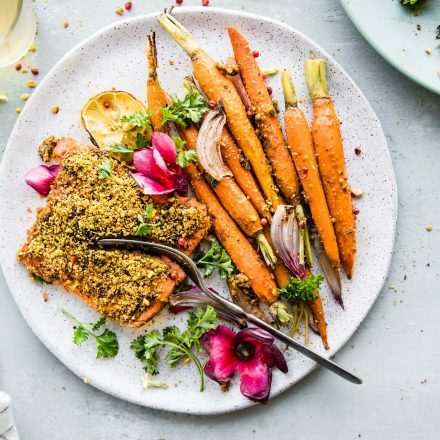 Putting this on the dinner menu immediately! such a refreshing and perfect lunch or dinner recipe! OMG, lettuce wraps are my fave!! These looks amazing! Pinning for later. Thanks for sharing! Thanks friend! Let me know whatcha think! OMG. I can’t wait to make these Linds! OMG!! this looks SO GOOD! I am kind of obsessed with these and am putting them on my TO MAKE list! This sounds amazing and i can’t wait to try it but I’m confused about the note about the sauce not burning. In the recipe you say to melt the sauce then add in the seared ribs but in the notes you say to add the sauce without melting so that it will caramelize but not burn? Can you please clarify, thanks so much! Oh thanks for catching that! Yes, melt sauce on sauté first, then add in seared ribs. I just meant if you add the sauce not melted to the seared ribs, then it might burn more. Does that make sense? 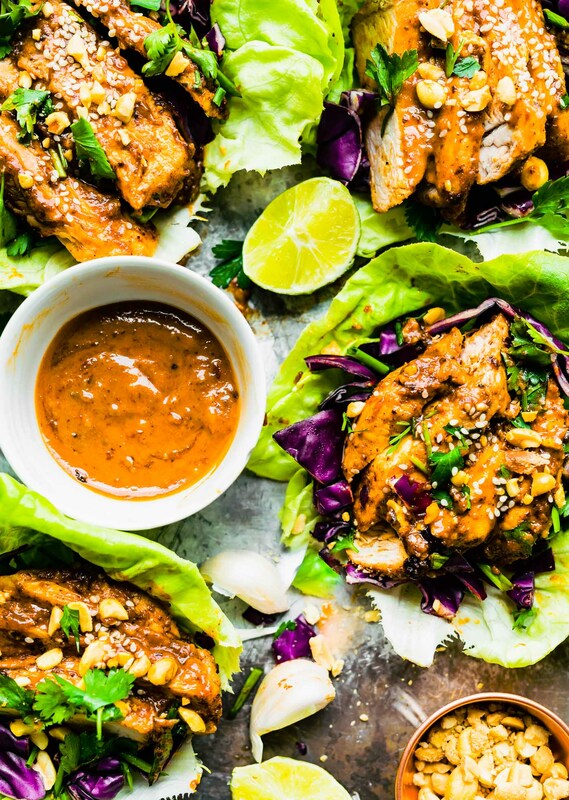 Those HUGE beautiful pieces of lettuce with the sticky pork just sounds sooo finger licking delicious. This turned out so good! Wonderful! So glad and thanks for the feedback!